She “grooved” and swayed to her unique style of music. Dramatically, she lowered her head then tossed her thick black hair backwards. She played the violin using the bow but sometimes she just strummed it. 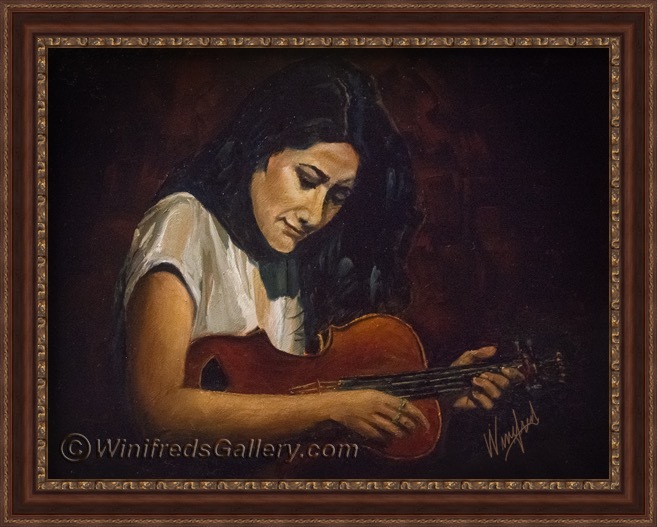 This entry was posted in Traditional Oil Painting and tagged The Violinist, Winifred Whitfield Oil Painting Portraits, Winifred Whitfield Oil Paintings by Winifred Whitfield. Bookmark the permalink. Winifred, this is lovely!! You are so talented!! Thank you Mayra. I enjoy the rather classical look of the Violinist. Painting the hands was completely stressful! !